We were prompted to brave the snowy path because Dave spotted a geocache nearby. We ventured off the trail into the deeper snow between the trees but couldn't find whatever was hidden there. We did find some great old stumps and fallen logs though! I like how geocaching motivates us to go off the beaten path and explore places we would otherwise ignore or feel awkward exploring 'for no reason'. The kids call it 'treasure hunting'. 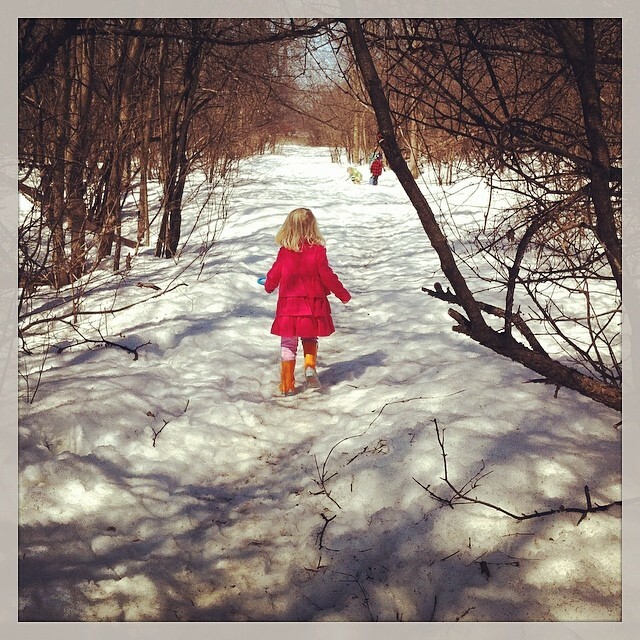 We're all looking forward to more treasure hunting and exploring in the warmer months, and getting outside much more! It's been a frightfully long cold winter. I am fond of winter, generally, but I am so eager to see this one go for good! With Andrew and I both feeling tired and sick this afternoon, it seemed like a good time to settle in front of the tv and watch the animated movie Rango. I've been curious about it for a while and so has Andrew, having seen the image on the Netflix kids menu. I'd told him we had to wait 'till we had time for a long movie and time for me to watch it with them. This was the time. I had suspected the movie wasn't really for their age level and I wondered if we'd end up switching to something different before too long. Within the first few minutes it was pretty clear that this movie was not really for their age level, as most of the dialogue and jokes were way over their heads. But Andrew and Ella were both mesmerized and I thought it was hilrious, so we carried on. About half-way through there started to be a lot of wild west gun slinging, and I wondered whether this had been a big mistake... I also kind of felt like a bad parent when the singing mariachi bird kept crooning about how our hero was going to die and Andrew said worriedly, "he's going to die?" I assured Andrew that Rango would not die, they were just joking to make us nervous, while I secretly thought I would never forgive Johnny Depp if this didn't have a happy ending! A: "Ella, do you want to play cowboys? Ella do you want to be a cowbo- cowgirl?" A: "Okay, Ella, put on this hat. It's just the right size for you." A few minutes later Andrew and Ella swagger into the family room, Andrew wearing a vest with his rifle tucked into it and Ella with a cowboy hat and ear protectors. It gets loud out on the range you know. I was inspired by the movie too and had lots of fun saying "ain't" and trying to swagger. I really loved seeing Andrew engrossed in pretending too. His wide-legged swagger was so cute. Ella may not have noticed much difference between this and the regular police-thief game, but she had a great time playing along. She also really like her deputy badge. I also remembered Dave's old hobby horse in the basement and brought it up so that sheriff Andrew could ride his trusty steed to chase down the bad guys. When it was time for bed I rounded up the posse and herded them upstairs. Andrew rode the hobby horse up and put it with his vest, police hat (that was added to the get-up too) and sheriff badge next to the bed, announcing "I am going to wear this every day!" Knowing him, he just might. ps - Ella is trying to copy my gun hands -- she's not really a hard metal rocker. "Mom! We learned a new letter at kindergarten today!" I am a nerd through and through, and I always loved school. Loved it. Except 3rd grade when our class gave our teacher a heart attack the first month of school and we suffered through a string of substitutes after that. My parents can attest that I became stricken with a mysterious stomachache-every-morning disease that year... But I digress. I have many good memories of school years, and so it warms my nerdy little heart to see Andrew enjoying school so much this year. Although he had some nerves at the end of the summer, he's been happy since day one. It seems that once he discovered what it was really all about, he realized, "this is awesome!" He's eager to go every morning, and comes home happy each day. Being Andrew, he doesn't offer up a lot of details about his day, but if we ask specific questions, like: "Which centre did you play in today?" he will answer with a big grin "the art centre!" or "the book center...with Sarah!" Andrew has made a wonderful new friend in this little girl in his class named Sarah. The two of them love playing together in the school yard at the end of the morning when Sarah's mom and I are both there to pick them up, and they've been writing each other notes and talking about each other outside of school lots and lots. They've really hit it off. Sarah's mom told me that Sarah said she loves the funny noises Andrew makes (when he's being silly & expressive) and then added that she rarely sees Sarah laugh as hard as she does when she's playing with Andrew. Even their teacher commented on their friendship in our parent-teacher interview, noting that they not only play well together, they challenge each other in a really positive way when working together in the centres. So sweet. And I mentioned Andrew writing notes? Andrew has become obsessed with writing since September. I knew he was pretty familiar with most of the letters of the alphabet before, but if we or the preschool teachers tried to get him to write his name, for example, he wouldn't have anything to do with it. Sometimes he would be willing to write his "A" but he would grumble "but that's it!" Now Andrew loves to write his name on his pictures, and he is often busy working on something when he'll call out, "Mom, what letter does Noah start with?" and then "what's the next letter?" and so on. If I help him sound it out, he often guesses the letter correctly, and it so proud when he does. He's particularly good at guessing the letter sounds if it is a letter that they've been working on in school, where they focus on one letter each week. Back in October, Andrew was asking for help spelling 'ghost' for his ghost drawing, and before I could even give any prompts, once he had "o" he said, "ghosssst, the next letter is S!" I was blown away. I love seeing his sweet little kid printing, written with such focus and determination and enthusiasm. The way letters are scrunched to one side or continue on the next line mid-word if he runs out of space. It is so adorable. And amazing. I want to save every piece of paper he writes on! I addition to writing lots of names and words with help on the spelling, Andrew's also been loving to write scribbles that are "pretend" writing, or series of letters that he will tell us say something or other. As "Policeman Andrew" he's been writing lots of "tickets" for people (although it's not always clear what the offences are...) and he's been writing lists, instructions, recipes and letters. He also started his own Christmas list for the first time. "Mama, what's the first letter in Police lego?" One day last month I also spied him copying letters from the crayon box onto the white board. It thought it was so cute that he copied them all backwards, and didn't see anything wrong with that. Neither did I. I thought it was just awesome. And my absolute favourite is the book that Andrew made last week. We had the paper and writing caddy out on the dining room table, where it lives rather permanently right now, and Andrew announced he would like to make a book. I rushed to get the paper cutter and the stapler, and Andrew helped me assemble his blank book. I heard later that there's been a book-making trend in the kindergarten class. While I was busy supervising Ella playing with the paper cutter (which she loved) and trying to get some dinner started and tending to Peter (who was fussy of course since it was that time of day), Andrew was working away on his book. It was an unusually hectic evening, and I didn't even get to see his book until the following night, which was after he'd brought it with him to kindergarten. Andrew told me that he'd read it to his class at the end of kindergarten, and I was a little surprised, knowing that Andrew can be quite shy and not knowing if there was time for things like that in the busy kindergarten schedule. But our parent-teacher interview was the next day and his teacher confirmed that Andrew did really enjoy sharing his story with the class at the end of the morning. She said that he read softly so she just repeated after him so that everyone could hear. I would have loved to have seen that! Luckily Andrew granted me an encore presentation that night at bedtime. It is a story about a ghost who says "Boo!" and scares everyone, including a goose and a daddy ghost. On the cover Andrew wrote his name and Sarah's name too, you know, just 'cause. I want to scan the book & post the photos, but that will have to wait until later as Peter is sleeping in my lap right now and we're both happy to stay put for the moment. I used to think of Halloween as a one-day event, but now with little kids it has become a season. Andrew loves Halloween. He enjoys the costumes and all the silly and spooky decorations -- just as long as nothing is really scary. Andrew noticed some houses on our street decorated for Halloween when we were walking home from kindergarten about two weeks ago, and he asked excitedly if we could decorate our house when we got home. So that's what we did that Friday afternoon. I found our little box of Halloween decorations from previous years, which included some construction paper bats and pumpkins made by Andrew and Ella, and some homemade ghosts that Andrew and I made two years ago. Andrew's favourite was hanging the spiderweb outside on the brick wall near our door, and dotting it with plastic spiders. Ella enjoyed it too, happily announcing "Me! Me!" as she helped to pull and pat the webbing against the wall. Andrew wished that we had even more spiders, so I found some black pipe cleaners and we made a few more big spiders for our scary web. "Everyone who comes to our house on Halloween will be so scared of our spooky spider web!!" Andrew was positively gleeful! We also made some new halloween artwork that afternoon - more pumpkins out of construction paper, and some pictures of scary spiders and bats with black paper, lots of glued-on googley-eyes and many pointy teeth drawn with crayon! The following week Andrew and Ella had lots of fun one afternoon painting some wooden skeleton decorations that I'd happened across one day while running an errand at the craft store. Andrew was pretty careful about paint different bones different colours, and Ella was more freestyle, mixing her paints a lot. At first Andrew really wanted to take his skeleton to school and hang it in his kindergarten class, but later he seemed to forget that plan, thankfully. I really want to keep his work of art to hang up every Halloween! The kids enjoyed decorating for Halloween so much, that I wanted to find some kind of easy and fun Halloween baking we could do together. At first my google search for inspiration didn't turn up anything that looked easy for anyone but a professional baker, never mind easy to do with a 2- and 4-year-old! But then I saw a photo of 'skeleton cookies' - which were just basic gingerbread man or animal-shaped cookies with 'bones' drawn on with white icing. Perfect! That's something we could handle. Ella helped me make the cookies one morning (she LOVES to help in the kitchen - stirring, cracking eggs, measuring), and then Andrew, Ella and I iced them together that afternoon. Andrew and Ella iced a few on their own, then I admit that I did the rest. They turned out pretty cute, I regret not getting a picture. But I'm sure we will make them again - just like we made peg-leg pirate cookies many times. A gingerbread man cookie cutter really is so versatile! Finally, this weekend was full of pre-Halloween activities. On Friday, Dave took off work early so that we could go to the local fruit farm for our annual pumpkin picking and photo shoot outing. We'd almost forgotten about it this year, with our lives a little bit more busy these days. But fortunately the weather was sunny and beautiful for our last minute visit. Andrew was sooo excited when we announced that we were going to the farm to pick pumpkins. He and Ella both thoroughly enjoyed exploring the little barn full of pumpkins, climbing around them and picking a few special ones. And then a few more. And just a few more... It's amazing that these simple round orange squashes can bring so much joy to little kids! We came home with 11(!) pumpkins and gourds of varying sizes, and a big bag of local apples and apple cider too. On Saturday morning, we attended a little halloween party at Andrew's good friend Noah's house. There were about 8 or 9 little kids, all Andrew and Ella's ages, and it was amazing how well they all played together (or alongside each other) without anything getting too crazy. Us parents actually had some time to relax, drink coffee, and chat! It was a great morning all around. Today, Sunday, is All Hallow's Eve Eve, and we spent a good chunk of the day out at Proulx Farm. Andrew & Ella had lots of fun playing on the play structures, tractor trikes and the inflatable bouncy pirate ship. They both had turns going down the big slide on burlap sacks with Daddy, while Peter & I watched from below. Well, I watched while Peter slept in the wrap carrier. Ella and I visited the petting animal barn, and she loved seeing all the animals and naming them all. "Baa" (sheep), "neigh" (donkey that she thought was a horse), "uck" (duck), "pig", "bur" (bird)... There was a cage full of bunnies who were eager to be petted by the children, I guess because they often get fed. Ella was delighted to stick her fingers through the wire and pet them, until one nibbled her finger in hopes of food, and then she started to cry. Her tears were soon dried, however. I think it hurt her feelings more than her finger! Andrew & Daddy were climbing hay stacks while Ella, Peter & I were looking at the animals, and then we all took the spooking wagon ride through the fields and the woods. Later we had some lunch from the chip truck and caught the end of a magic show. The show was all in french, but some humour needs no translation - Andrew and Ella were totally cracking up at his silly act. Finally, after we came home we spent the rest of the afternoon carving pumpkins. Andrew drew the face he wanted on paper first -- an angry pumpkin with big scary teeth -- then drew it on his pumpkin all by himself, and Dave carved it out. Ella said she wanted a happy pumpkin, so we put a simple happy face on her little pumpkin. I made a surprised pumpkin, and Dave gave his an angry face. Andrew loved that, and said how his pumpkin was angry, but Dave's was more angry, the "angriest pumpkin" Then he added something like, "Dad, your pumpkin is the Angry Mommy Pumpkin!" Umm... is this kid trying to tell me something?? Dave and I both had a good chuckle over that. Andrew also designed Peter's pumpkin, instructing Dave to give it square features. Thinking outside the triangle! Andrew has a new pet. A fuzzy little black and brown caterpillar. I spotted it on the grass in our front yard Saturday morning, and Andrew and Ella were very interested and impressed. The little guy curled into a ball when Andrew tried to pick it up, then Ella grabbed it and started running around the yard with it. I was quite concerned that she would accidentally squash the poor thing in her fist, but luckily it survived long enough to be handed over to Andrew, who is quite gentle with little creatures. Andrew announced that he would like to keep it, and was already busy gathering leaves and grass for the caterpillar to eat. I remembered that ages and ages ago I had on a whim bought a little plastic insect terrarium at the dollar store for Andrew and tucked it away for future use. I actually managed to remember where I'd put it, and Andrew was very excited to settle his new friend in its new home. Andrew's been giving his "calerpitter" much love and attention. He checks on the fuzzy thing often, takes it out to pet now and then (while I worry about squished caterpillar accidents on the floor or couch), and insists on keeping the terrarium on the bedside table while he sleeps, because "The calerpitter wants to be close to me. He doesn't want to be lonely." After we brought the caterpillar inside, I did an internet search to find out more about it. It's a Woolly Bear caterpillar, and turns into a Tiger Moth. I learned that the Woolly Bear spends all winter in caterpillar form (hence the warm fuzzy coat?) and only pupates into a moth in the spring. Uh oh. This caused me some concern, since of course Andrew had announced "I will keep it in here until it makes a cocoon and turns into a moth and then I will let it go!" Dave and I couldn't imagine that a caterpillar could survive six months in captivity, even (or especially) under the very loving attentions of a four-year-old. However, a few days later, after watching how Andrew was still very attached to his new pet, I did some more online research. Google search: "Raising woolly bear caterpillars in captivity." The wisdom of the Internet suggests that we may be able to keep the caterpillar alive until it turns into a moth. We can keep it indoors and continue to feed it (clover and dandelions are favourite treats - no wonder this thing was on our lawn!) until the weather gets cold and the caterpillar starts to go dormant. Then we are supposed to move it to a sheltered cold place out of the sun, like the garage or porch, and leave it undisturbed until early spring, when we need to watch for signs of activity and the begin feeding it again. If all goes well, the caterpillar will then work its magic and transform into a moth. I explained this to Andrew and he was very excited. He then explained it to his Dad. Andrew told Gammy all about it too when she came over yesterday. Andrew enlisted Gammy's help to gather up some more food for the "calerpitter" and as soon as they went into the back yard to pick some grass and clover, what did Gammy see right next to her foot? Another calerpitter! Another Woolly Bear, a little smaller than the first one. So now we have two house (garage) guests for the winter. I hope they get along. Andrew starts kindergarten tomorrow. It's hard to believe that the big day is really almost here. Although it's not that big of a change from preschool, really, I find it hard to wrap my head around the fact that my little boy will be off to school every day of the week now. And that before I know it the years will slip by and he'll be there every weekday for full days. Slowly and inevitably, more and more of his life will be taking place outside the home and away from us. Although some days can seem interminable when in the midst of the messes and the tantrums, these preschool years really do slip by so fast. Kindergarten doesn't mean that my little boy is all grown up, but it is a reminder that someday he will be, and it will be sooner than I think. Andrew's looking forward to tomorrow. He met his teacher for the first time this past week when we had a one-hour meeting with a few other families at the school. A couple of Andrew's friends from preschool will be in his class and were there for the interview at the same time, and that made them all feel more comfortable. All summer Andrew's been pretty unenthusiastic about kindergarten, but since he saw the school and the classroom and met his teacher, he's whole attitude has changed. The very next morning he asked when he would be starting, and this weekend he's been excitedly telling people that he'll be going to kindergarten this week. Tonight he went to bed easily, without a single anxious question or confession of fears. I'm so glad that he's feeling good and excited about it, and I hope that it carries through tomorrow morning, and the rest of the week. I think that the fact that we've enjoyed a really nice weekend has also helped to created a positive mood for starting school. Yesterday we had a fun afternoon at my parents' house, with lots of time spent playing on the deck and in the yard, enjoying the breezy September weather. Today we spent the morning reconnecting with friends at the preschool annual fall family welcome. It was another beautiful sunny day with a crisp breeze, perfect for playing outside. Andrew had a great time with his best buddies Noah and Jamie, and Ella seemed delighted to finally get to stay and play at the preschool playground, after so many days of picking Andrew up there and having to leave right away. Andrew will be back at the preschool two afternoons a week, and Ella will be in the toddler program two mornings a week. Her first day will be later this week. Although I'm sure she will be nervous at first when I leave, it seems like she will really enjoy it there and settle in quickly. She was playing with lots of other kids today, and even helped her new teachers tidy up at the end of the morning. This afternoon we were busy canning peaches at our house with Dave's parents. We're doing it at the very end of the season again this year, which is less than ideal since some of the peaches are not the best. It was a bit hectic and messy, but we managed to get two batches canned and processed before bedtime. It wasn't the most efficient operation, but at least we got some done, which impresses me! Are there any better playthings than an empty box or a basket with a carrying handle just waiting to be filled with all sorts of things real or imaginary? When we were leaving the house, Andrew wanted to bring his kite. We tried to tell him that it should say in the garage because there wasn't enough wind to fly it, and he could carry it while riding his scooter anyway. But Andrew was so determined that I agreed to carry it for him, just so that we could get going and still be all feeling cheerful. When we arrived at the park, we discovered that, low and behold, it was a perfect day for flying a kite. Mommy clearly doesn't always know best. Andrew was delighted to get his kite up in the air. This summer there were so many days when he kept asking to fly a kite when there really, really wasn't any wind. On a hot, hot day in July, two gleeful and silly boys spent a long and happy afternoon together in the pool. Andrew also got a snorkel and mask at the toy store, which he had a lot of fun experimenting with that day. Andrew's been getting really comfortable and confident in the water this year, which is great to see. He and Josh have been taking swimming lessons together since the winter, and both boys have progressed so much from their first class, when they were both pretty nervous and reluctant. At the beginning of the summer Andrew was slow to venture off the steps at my parents' pool, but now he dons his life-jacket and walks right in without hesitation. He can swim around the pool independently with his life jacket on, and will stay in the pool for hours if you let him. This past Saturday my mom brought out some snacks for everyone, and while Josh and the rest of us were eager to take a break and refuel, Andrew was slower to listen to his growling tummy. And even when he did come out for a bite, it was really just a bite. He'd stand at the patio table on the deck, eat one cherry, and then run back to the pool for a few minute before coming back for another little nibble - one slice of watermelon or orange, or two chips quickly chomped down en-route back to the water. Ella was in the water on Saturday too, and really enjoyed herself as well. Although she loved her swimming lessons all winter, she's been less enthusiastic about swimming in the pool at my parents' house so far this summer. I think it's just because the water was a lot colder earlier in the season than the heated indoor pool where the kids had their lessons. Ella's not the little heat generator that Andrew is, so she does get chilled more easily. But this weekend the water was super warm from the heat wave Ottawa's been having, and though she was reluctant to put on her suit and jacket, Dave managed to get her into the pool and within a few minutes she was all smiles. She enjoyed going around with the inflatable seal floaty, and later she really loved lying on her tummy on top of a pink air mattress, while we took turns driving her around the pool. That was the ideal ride for her, because she was up high enough to be able to see everybody, but there was enough water coming over the sides to keep her wet and cool. After her little swim Ella spent the rest of the afternoon playing on the deck or inside. While we were having snacks at the patio table, Ella was amusing herself with pouring water from a cup onto her feet and onto the deck, and then jumping and dancing and splashing in the little puddle she'd made. She'd grin and laugh and do it again and again. I was able to get in the water for a few swims as well, which was so nice. This past week was the first time I'd really been swimming all summer, since the bed-rest restrictions had pretty much limited what I could do in the pool earlier. It's not so much fun to just stand around in the water, especially when the water temperature was still in the lower 70s! It felt great to cool off in the water during this hot weather, and the relative weightlessness of being immersed was refreshing as well. It was easy to forget the giant belly and 40 extra pounds while gliding around the pool, except when I tried to float. Once I'd get closer to horizontal in the water, it was like my belly was a huge weight pulling me down and my centre of gravity was all off compared to what I'm used to in the water. Strange sensation indeed. Today we had a nice, productive day sticking close to home. Dave and the kids ran some errands in the morning, while I did some overdue cleaning, vacuuming and washing the floors on the main level. It felt good to get that done! After lunch we were all tuckered out. Ella had her regular afternoon nap, and Dave and I both dozed on the couches for a little bit while Andrew was watching some Curious George videos. Dave also managed to assemble the new kids picnic table that we'd bought yesterday (a nice big one with lots of room for 3 kids and friends!) and after the afternoon siestas Ella and I made some yummy pan chocolate chip cookies together. I haven't had much chance to bake or cook with Ella yet, and it was a lot of fun. She was right into it, enjoying scooping ingredients with help and dumping them into the mixing bowls. I can tell she's had some good practice with grandparents. Ella helped crack the eggs too, which she really loved. I had to guide her a little to keep her from crushing the whole thing, shell and all, into the bowl, but in the end we successfully added two eggs without a single errant bit of shell! Andrew and Dave were up to some silliness in the living room while Ella and I were baking, and then Andrew came into the kitchen just in time to help lick some cookie dough off the mixing spoon while I was cleaning up. Later, Dave made dinner (tomato-based chicken curry with rice - yum) while Ella and I looked at some books and Andrew played with legos. While I'd been cleaning this morning I'd seized the opportunity to move some dust-collecting and misplaced toys down to the basement in order to reduce the level of clutter and chaos a bit. In their place, I brought up the box of legos that had been out of rotation for a few months, and Andrew discovered that right away when he got back from the morning's shopping trip. He played very happily by himself with the legos for quite a bit throughout the afternoon and evening. I enjoyed watching him, the serious look on his face as he was all absorbed in his creation, searching for parts and trying to figure out how things might go together. For a moment I was struck by how much older he looked, and I thought of how he will be starting junior kindergarten in a little over a month from now. It is wonderful to watch him grow and learn and thrive, but there are these little instances when it is so bittersweet, feeling how fleeting these preschool years really are.